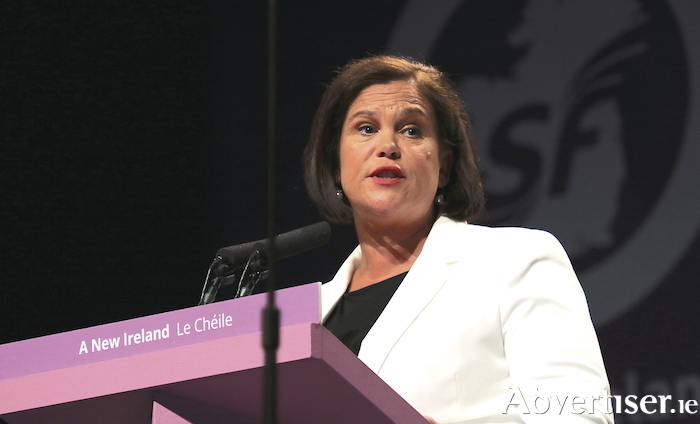 Sinn Féin president Mary Lou McDonald, TD. Sinn Féin’s new leader Mary Lou McDonald made a whistle-stop visit to Galway last Thursday and, despite that day’s chaotic traffic and torrential rain, she found time to sit with me and talk about issues like Brexit, Stormont, and entering government in the Republic. McDonald comes across as warm and personable, though her replies also have the well-drilled air of the seasoned political operative she is. I began by asking what issues will Sinn Féin be campaigning on in Galway at the next election. “Housing, health service provision, and decent work,” McDonald replies. “Lots of people are in insecure or low-paid work, many families worry about being able to pay their bills. We have to get these basics right; it is shocking the level of rent in Galway and a scandal that people are left on housing waiting lists. For many people now, home ownership is beyond their achievement. Decades ago when Ireland was poor we could still put roofs over people’s heads. This is all about political leadership and having a plan with the State and the public authorities doing the heavy lifting. Private developers have their role but the State has to lead and impose real rent control. Last November, Galway senator Trevor Ó Clochartaigh quit Sinn Féin citing "serious disciplinary issues" within the party. He is one of a raft of party members who have left in similar circumstances, or amid claims of bullying, over the past year or so. McDonald gives her response to this issue. Sinn Féin argues that, post-Brexit, Northern Ireland should retain a Special Designated Status within the EU. “Some 6,500 companies trade north to south but the same number trade east to west between Ireland and the UK,” McDonald points out. “In cash terms that is much more valuable, but the north to south trade is much more jobs intensive. It is absolutely critical that jobs aren’t lost, that standards of living are protected, and that the legal underpinnings of the peace process are not undermined. If Brexit is not a party political football for Sinn Féin, some might argue the Irish language act is, given just 0.2 per cent of the population in Northern Ireland use it as their main home language. Yet it remains one of the factors preventing SF going back into government in Stormont and addressing Brexit there. “We had an accommodation on Acht na Gaeilge last February which was not perfect from the nationalist view but we regarded it as representing sufficient progress,” McDonald notes. “Also, in the first instance Stormont came down because of the corrupt RHI ‘cash for ash’ scheme which came from within the DUP and if a similar scenario had unfolded in this jurisdiction the Government would have fallen. That concern, not just among northern nationalists, about low standards in high places is very real and has been fuelled again in recent days by the carry-on of Ian Paisley jr.
"Acht na Gaeilge is part of the parity of esteem that is hard-wired into the Good Friday Agreement. One could say also what’s the big deal about marriage equality but the biggest parade now in the North is Pride. There’s a generational switch now where people don’t want to live in a confessional state at the behest of the DUP, and have their rights denied because they are not in line with someone’s theological view of the world. The legacy issue is also massive across northern society, it’s not just a republican issue. Yes people want government to resume, but what we’re hearing from people on the doorsteps is get the institutions back but get them right, don’t just go back in on a wing and a prayer hoping that things will be different."